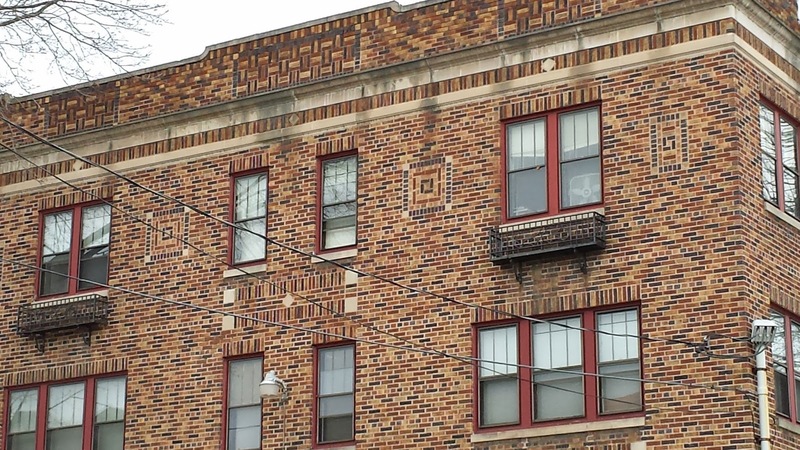 I recently wrote about the austere design of the Chaumont Apartments at 502 University Avenue, which used patterned brick as decoration - a common touch in the 1920s. A block away is the Washington Arms Apartments that mixes Gothic and Art Deco motifs to create a dynamic form with an impressive entrance way, in what I called a Gothic-Deco mix. More of this Gotho-Deco can be found at the former Madison School on Madison Street between University and Walnut, about equal distance between the two apartment buildings and directly across from the north flank of Temple Concord (1911). 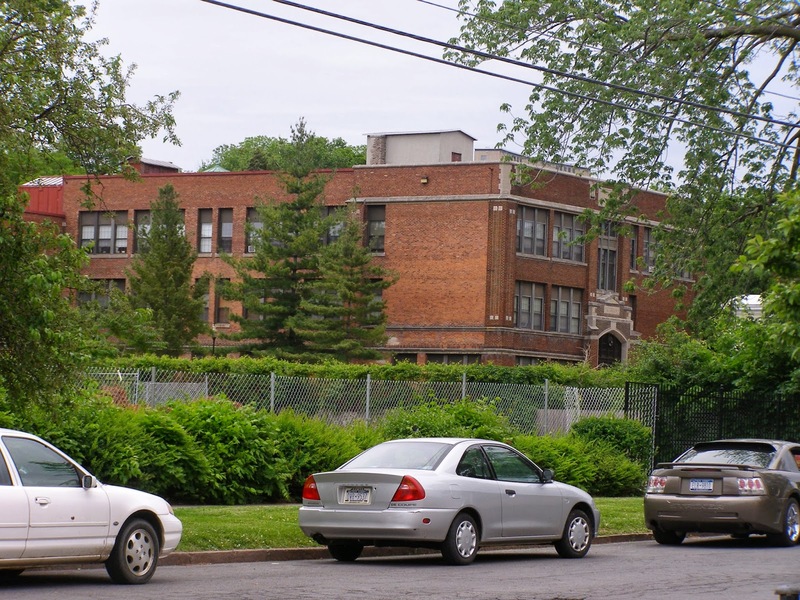 The Madison School was built in 1917, not long after Temple Concord - after the sanctuary building but before the 1920s classroom building which replaced three adjacent row houses, and faced the new school. James A. Randall (1861-1940), already a prominent local architect who would become one of the region's most prolific school designers, was the architect. We can watch his style develop over several decades, until he is working in the full Art Deco of the Grant Junior High School, built in 1931. The Madison School is a transitional building. Like most schools, the plan is the main thing, but the exterior articulation had to set a tone, too. It is symmetrically designed, and had entrances for girls and boys at opposite ends. The building had three floors of well lit classrooms which in the 1980s were converted into residential condominium units. A main formal entrance, up a flight of exterior stairs, was set beneath a wide flattened Gothic arch facing Madison Street. The organization of this entrance with its upper two turrets adapts a traditional English Gothic tower-gate design that was well known in America through its common use at colleges and universities (Princeton, Penn, etc.). The entrance element no longer was defensive, but stood instead for an ideal of serious education. Between the little towers, and over the chiseled stone with the school's name, is a short combination parapet-pediment. In the center of this shied resting on branches, and within the shield is an open book. The book makes sense for a school, but also coincidentally parallels the Decalogue (Ten Commandments) set about the pediment of Temple Concord's classical porch. Randall had previously designed classically-inspired educational buildings, including the Carnegie Library on Columbus Circle in Downtown Syracuse, and only two years earlier (1915), the big Blodgett School on the West Side. That building, with its columns and other classical-Italianate elements was a direct descendant of the Central High school designed by Archimedes Russell and Melvin King that opened in 1910. Both Randall and King would keep working to strip down their school designs to reduce costs and also to standardize a building type. The trend is clear in the 1924 Nottingham High school by Albert Brockway, which has no Classical or Gothic elements, and no monumental entrance either, though there is still a bit of patterned brick and a few inserted limestone or cast stone blocks for decorative accent. But overall, the form of the building looks like a factory for learning. Compare it, for instance, to Ward Wellington Ward's 1909 Moyer Automobile Factory. 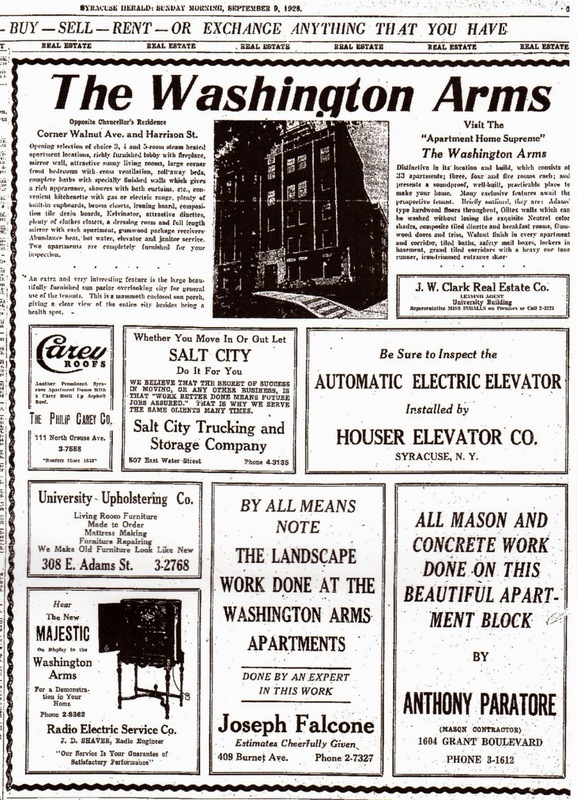 The 1920s were years of easy credit and fast money, and that meant a real estate and building boom in most American cities, and Syracuse was no exception. Architecturally, the period offers a mix of styles, with Classical, Gothic and Byzantine styles still popular. But throughout the decade a simple functionalism also took root - in part keeping with a taste for stripped down style in art, literature (think Hemingway) and fashion (think flapper), but also because it was generally more economical for speculative builders. Higher end buildings had more decoration, but this tended to be variations of the flat, often geometric Art Deco. The simpler version could be substituted, as was done in Chaumout Apartments, by simply patterning brick. When one thinks about Walnut Avenue on the east side, the large houses - mostly now frat houses along Walnut Park - come to mind. But in the early decades of the 20th century the older part of Avenue at he north end was already being transformed with new apartment buildings rising replacing 19th-century single family homes. I've written about the Sherbrooke Apartments at Walnut and Madison, designed by Ward Wellington Ward in 1914. 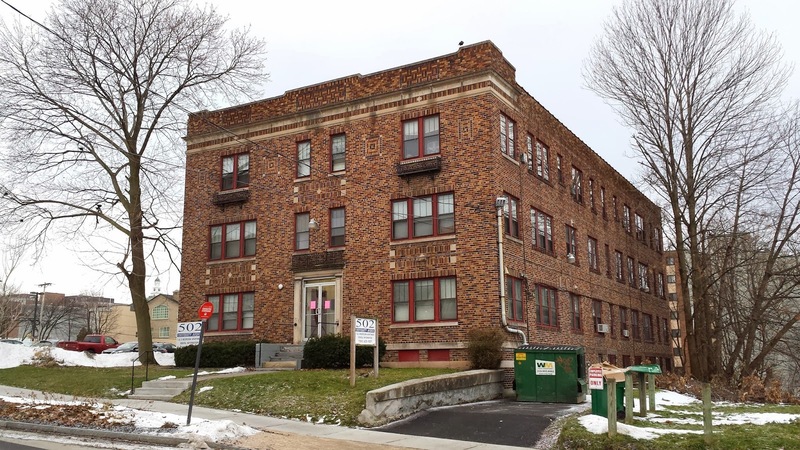 Another noteworthy apartment building is the soaring (everything is relative) Roosevelt Arms Apartments one block south, up the hill, opening in the fall of 1928, at 621 Walnut Street. This fine building, the architect who which remains unknown to me at this time, is a fine example of everything that was though modern at the time (we known, however, that Anthony Paratore, was the contractor). 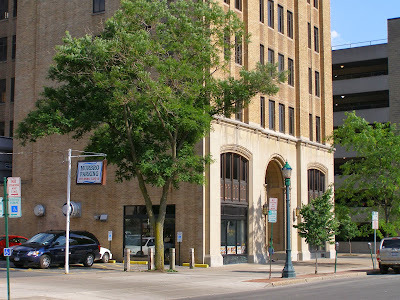 The building shares characteristics with the commercial Hills Building downtown, built the same year. Both are steel frame and brick buildings that emphasis versatility in their sleek design, but bow to tradition with the inclusion of stylized vestigial Gothic details on the ground floor, and on in certain other details. We might call this type of Art Deco building a cross - something akin to Gotho-Deco. The combination was surprisingly common in the 1920s. For vertical building its a kind of mash-up of the New York's City giants, the Woolworth and the Empire State Buildings. While the outside of the Washington Arms no doubt looked strikingly modern on Walnut Avenue, possibly as out of place in its time as Bird Library at the top of Walnut Park would be seen in its time (and even today), it was the modernity of the inside of the apartments that them desirable. 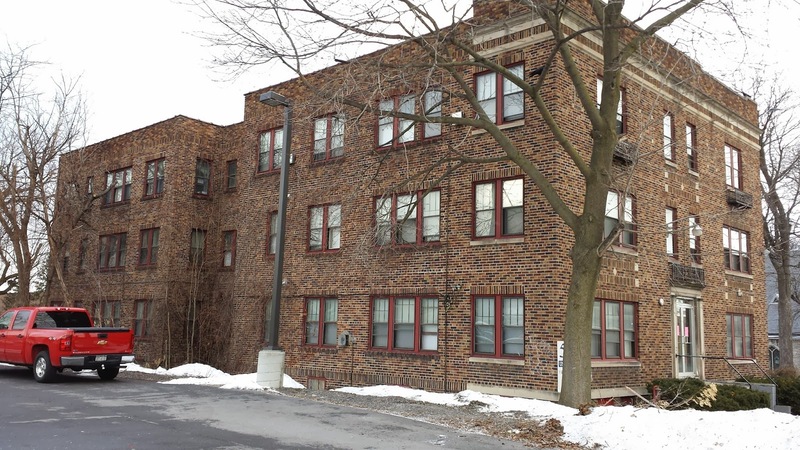 Advertised as the "most exclusive apartment in Syracuse" and the "Apartment Home Supreme,", Washington Arms boasted large kitchens, plenty of closets, gumwood doors and trim, tiled baths and storage lockers in the basement. Corner Walnut Ave. and Harrison St. Opening selection of choice 3, 4 and 5-room steam heated apartment locations, richly furnished lobby with fireplace, mirror wall, attractive sunny living rooms, large corner front bedrooms with cross ventilation, roll-away beds, complete baths with specially finished walls which gives a rich appearance, showers with bath curtains, etc., convenient kitchenette with gas or electric range, plenty of built-in cupboards, broom closets, ironing board, composition tile drain boards, Kelvinator, attractive dinettes, plenty of clothes closets, a dressing room and full length mirror with each apartment, gumwood package receivers. Abundance heat, hot water, elevator and janitor service. Two apartments ere completely furnished for your inspection. An extra and very interesting feature is the large beautifully furnished sun parlor overlooking city for general use of the tenants. This is a mammoth enclosed sun porch giving a clear view of the entire city besides being a health spot. Visit The "Apartment Home Supreme"
Distinctive in its location and build, which consists of 33 apartments; three, four and five rooms each; and presents a soundproof, well-built, practicable place to make your home. Many exclusive features await the prospective tenant, Briefly outlined they are: Adams type hardwood floors throughout, Oiltex walls which can be washed without losing the exquisite Neutral color shades, composite tiled dinette and breakfast rooms, Gumwood doors and trim, Walnut finish in every apartment and corridor, tiled baths, safety mail boxes, lockers in basement, grand tiled corridors with a heavy one tone runner, iron-trimmed entrance door. The building is designed on an dumbbell or H-plan, with two blocks three bays deep a the west and east connected by a longer narrower block. This design, pioneers in the 19th-century for better tenement design, here provides, because the building is free-standing on a corner lot, abundant windows for all apartments. Compare this to the simpler blocklike plan of the Chaumont Apartments, where it was more difficult for light to penetrate deep into the building. The five-story structure originally 33 apartments, but the Great Depression put pressures on this building, as on so many other new apartment and commercial buildings. Already in late 1929 and early 1930 it is clear that many units were becoming available. 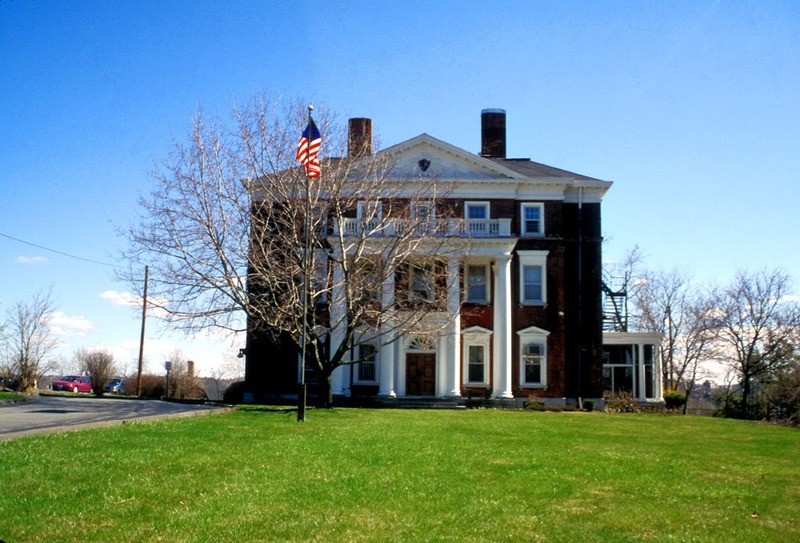 According to the Syracuse University Archives website (a great source on SU buildings), Syracuse University acquired the Washington Arms in 1943 to house Army Air Corpsmen, but because of housing shortages caused by the war, the soldiers were moved to other quarters and the apartments were available for civilian rentals. In 1946 nursing students lived in the apartments and by 1950 it was a women's dormitory. the building was renovated in 1978 and again in 2002. 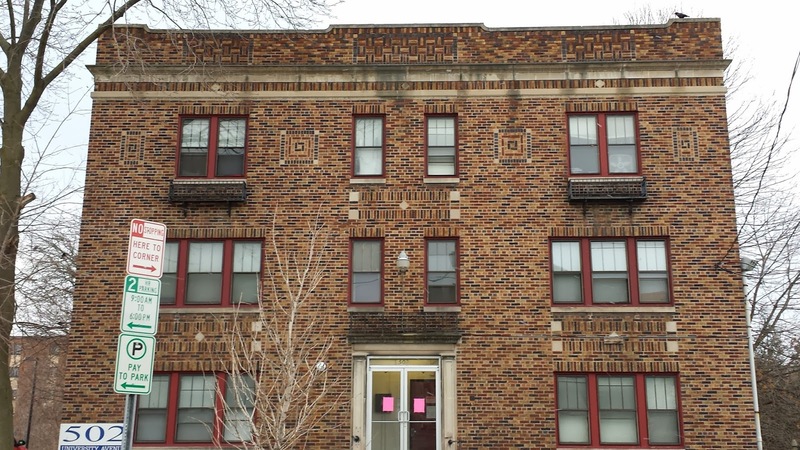 By 2010 housed 64 students in suite-style rooms with full kitchens on each floor. 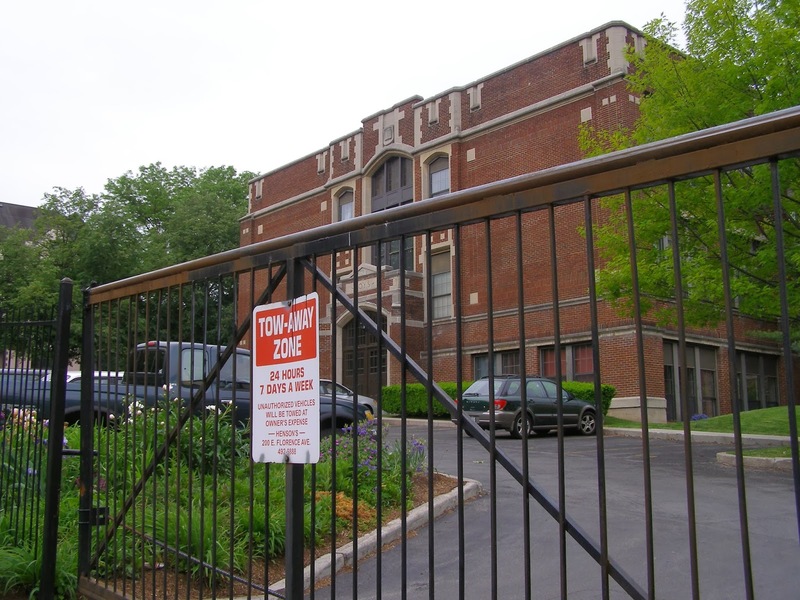 One of the many ironies of the development of the Connective Corridor on University Avenue is that for more than a decade before the project the University had pursued a continuing program of acquisition and demolition of older properties, leading to the much of the desolation of the street that was used, in part, to justify its redevelopment. Yes, the money has (mostly) come from government sources intended to "save the rain" but it was the policy of demolition over renovation that caused that particular street - of the many north-south axis on the Hill, to receive attention. Gone are the Wyatt House and the former Chancellor's House, both of which I watched as they were torn down. 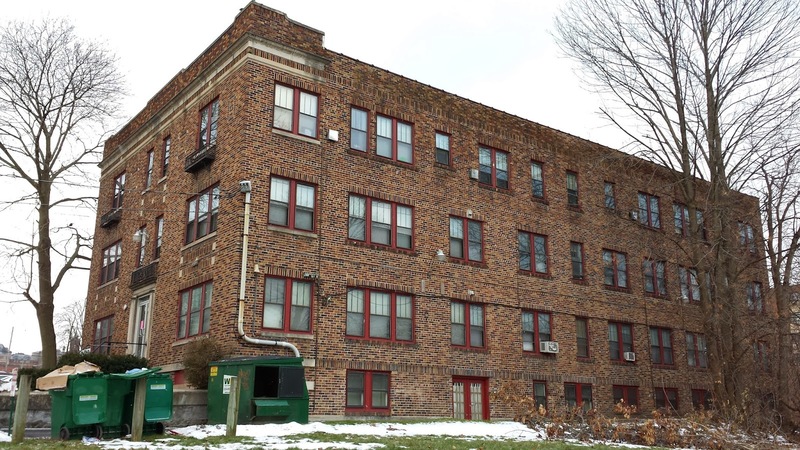 One building that was spared - and a good thing too - since it is one of the few properties on the street that pays taxes - is the brick apartment house at 502 University Avenue, just south of Madison Street. Known as the Chaumont Apartments when it opened in late 1928, the building is a proto-modern structure that sits on the cusp of the stylistic change between Art Deco and the International Style. The Chaumont Apartments, developed by Ben Menter and designed by architect James F. Schindler, was one of many apartment houses erected throughout the city in the late 1920s, and especially in 1928 ad 1929, that were built quickly to cash in on a booming housing market, and combined practical and efficient design and use of material with just the minimum of decoration to provide the residents with a little class. The building was erected of "brick, tile and steel," (Syracuse Herald April 4, 1928) and is reported to have cost about $65,000 to build. The most distinctive features are the decorative designs made of brick patterns. 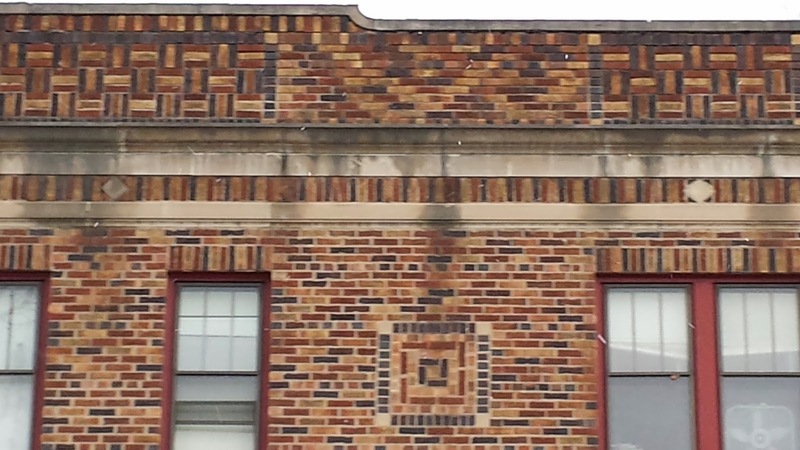 Similar designs - an attractive and very inexpensive type of decoration - can also be found on contemporary low-scale commercial buildings such a those found nearby on Westcott and East Genesee Street. The decorative patterning maintains the building's flat walls and and simple rectangular geometry. Only a slightly raised attic level parapet wall atop the facade breaks the box. The Chaumont is right across the street from the classical style Temple Concord, built in 1910-11. The flat simple geometry of apartment is in scale with the Temple, and its plainness offers a nice foil to the older more monumental building. If anyone has information on either Menter or Schindler, please let me know. I suspect Menter was Jewish - just by his name - but also because the location of the building was close to the heart of the Jewish neighborhood of the 1920s. In addition to Concord, Temple Adath was erected just a few years earlier jut one block southwest. The Preservation Association of Central New York (PACNY) will hold the Annual Meeting of its members on Sunday, January 12, 2014 at 1:30 PM at Barnes Mansion, 930 James Street, Syracuse, New York. The business portion of the Annual Meeting will include a report on the affairs of PACNY by Board President Murray F. Gould. The meeting will include election of six new board members. You can read about them here. All members are invited to elect the Board, participate in the meeting and increase their involvement by serving on the many PACNY committees. Not sure if you are a member? You can renew or join at the meeting or go online here. 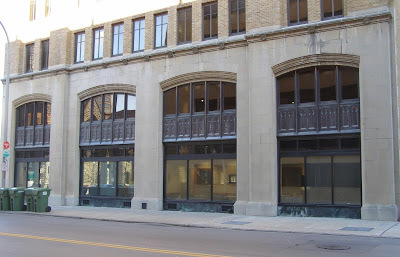 Since 1974 PACNY has been the voice for historic preservation in Central New York. An all-volunteer organization PACNY depends on member involvement for success. There are many ways to support the organization and its mission - through committee work, money, education and outreach, events, networking, advocacy, and technical skills. Come to the annual meeting and find out how you can help - or take the initiative and propose an issue or event that you think is worthy. During 2014 PACNY will be celebrating its 40th anniversary and throughout the year the organization will be featuring events, lectures and tours that will look back on these years. The keynote speaker for the Annual Meeting is Barbara G. Bartlett, Executive Director of the Lorenzo State Historic Site in Cazenovia. Barbara served as Executive Director of PACNY during the organization's early years. You can follow PACNY on Facebook here. 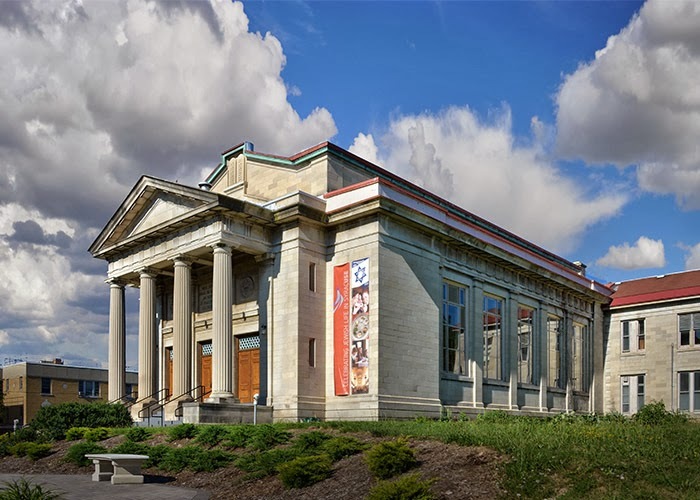 Spectacular photos of the National Register listed Temple Concord in Syracuse have been added to the impressive website Synagogues360.org. The synagogue, built in 1910-11 was designed by architects Alfred Taylor and Arnold W. Brunner. The congregation is the oldest existing Jewish institution in Central New York, and the synagogue is the oldest extant synagogue in the region. Visit the site and see the Temple Concord pictures - but don't stop there. Explore some of the other remarkable and often beautiful buildings represented. Oklahoma-based photographer Louis Davidson started the ambitious site several years ago, and now has provided 360-degree panoramic pictures of almost 250 synagogues worldwide. These views and the accompanying single point-of-view shots provide the very best imagery of existing synagogues anywhere. We can only hope that Louis and his wife Ronnie can continue their travels, and the pace and quality of their work. Eighty-four American synagogues have now been added with more to come, and the Davidsons recently were in Europe again, too. Louis Davidson was in Syracuse last summer, also stopping in Rochester, Tupper Lake and Troy. I introduced him to Temple Concord and Temple Adath, and got to see him at work. He moves fast. Louis is a photographer, but he is trained as an architect and so has an architect's eye. He is not an historian or art historian - but his photos provide the resource for scholars and students alike to carry out more studies - especially comparative studies - about synagogue design, form and decoration. Synagogues360.org is a regular source for my Jewish Art and Architecture classes, so I'm glad to have Syracuse represented - and look so good! I would like to see a project like Davidson's - even without the 360-degree imaging - that will document all the religious buildings in Syracuse and throughout Central New York. My colleague Bruce Harvey has been doing some terrific large format black and white documentation of local churches (and also Temple Concord). This work should be funded and expanded. A few weeks ago I wrote about the Art Deco New York Telephone Building on East Fayette Street, built in 1928 overlooking Fayette Park. Another Art Deco Tower, the Hills Building, went up the same year just a block away, on the northeast corner of East Fayette and Montgomery Streets. The sleek soaring corner tower, designed by Melvin King, connects with its new Art Deco neighbor in form and height, but it also nods to the historicist architecture of Montgomery Street, especially the rich Gothic Revival cathedrals. In the Hills Building, King emphasized its verticality with uninterrupted rising pilasters that create an almost Gothic Deco, and he included Gothic-like detailing the ground floor retail facades, in the high-up gargoyle that extends toward the Montgomery-East Fayette intersection, and in the deocrative application of cast stone (?) shields above the second floor (carrying images of the Zodiac) and at the very top of the tower. Syracuse, NY. Former Empire House hotel from postcard. Syracuse, NY. 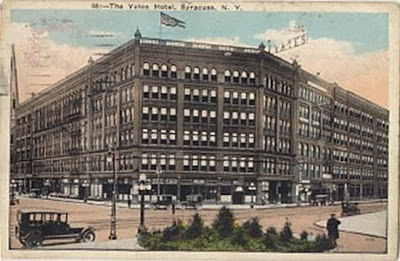 former Yates Hotel from postcard. 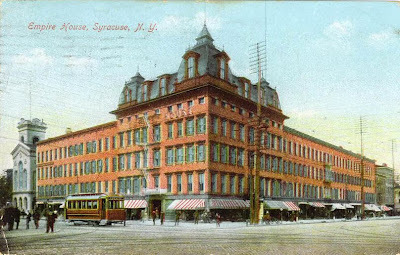 Historian Dennis Connors will lecture about the history of downtown Syracuse hotels at the Petit Branch of the Onondaga County Public Library on Saturday, January 18, at 2:30. 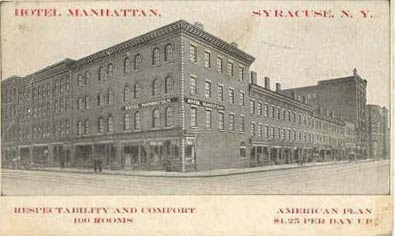 Dennis, the Curator of History at the Onondaga Historical Association (OHA), will talk about the long history of public accommodation in Syracuse - beginning in 1806 when Henry Bogardus built his tavern on the northwest corer of Salina and Genesee Streets until this year, when the new Marriott Courtyard Hotel opened downtown. For two centuries the location, size and decoration of Syracuse hotels has been a good indicator of the health of the city. 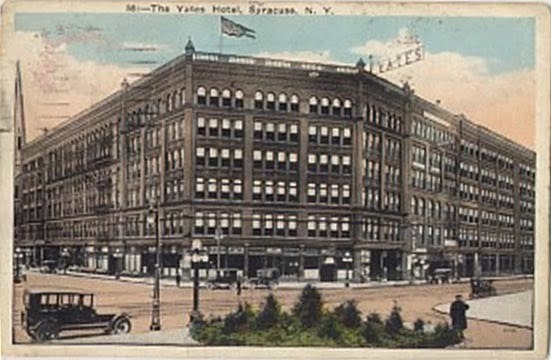 The elegant Yates Hotel and Hotel Syracuse were destinations - when Syracuse was a destination. Motels and chain-hotels at Carrier Circle and along the thruway and interstate are sign that Syracuse was/is a stop over; a place to pass through or pass by. In recent years we have seen a tiny revival in hotel life in the Downtown. The renovation and opening of hotels along East Genesee Street and University Hill (Parkview, Skyler, etc. ), the renovation of former Dome Hotel into the elegant Jefferson Clinton, and the construction of the large Marriott near Armory Square all of are part of our slow but steady Downtown revival. Come and join Dennis as he takes us through the hotel past, and introduces us to past hotels - some forgotten, and some still cherished in our collective memory.